1. Preheat the oven to 325ºF Butter a 9-inch springform pan and line the bottom with parchment paper. 2. Mix the milk with the vinegar or lemon juice in a small bowl or measuring cup, and let stand for 10 minutes at room temperature. 4. Whisk the flour, baking powder, and salt together in a small bowl. 5. Using a flexible spatula, carefully fold one-third of the dry ingredients into the whipped eggs, being careful to deflate it as little as possible. Fold in half of the soured milk, then fold in another one-third of the dry ingredients. 6. Fold in the remaining milk, then the rest of the flour mixture. 7. Dribble in the tepid, but still liquid butter into the batter, carefully folding it in as you go, just until it’s incorporated. Be sure to reach the bottom of the bowl as you go, to avoid unincorporated lumps of flour. Don’t overfold – better to have a few lumps than to deflate the batter. Transfer the batter carefully into the prepared pan and bake until it feels set in the middle (a toothpick inserted into the center will come out clean, about 30 minutes. Remove the cake from the oven and increase the heat of the oven to 400 deg. 8. 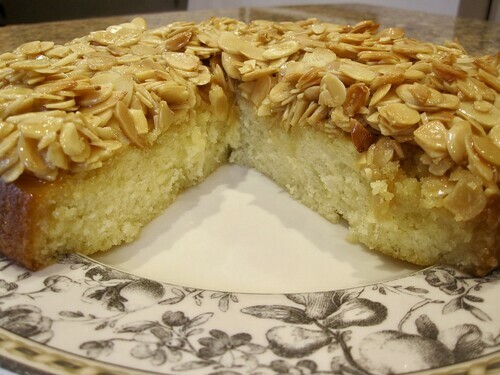 While the cake is baking, make the caramel-almond topping by melting the butter in the saucepan along with the brown sugar, milk, vanilla, and salt. Bring the mixture to a boil and cook for 2 minutes, or sooner, until it starts to thicken. Remove from heat and stir in the toasted almonds. 9.. Scrape the mixture over the cake and gently coax it over the top of the cake, reaching to the sides of the cake pan. Avoid applying any pressure so you don’t break through the top of the cake underneath. 10. 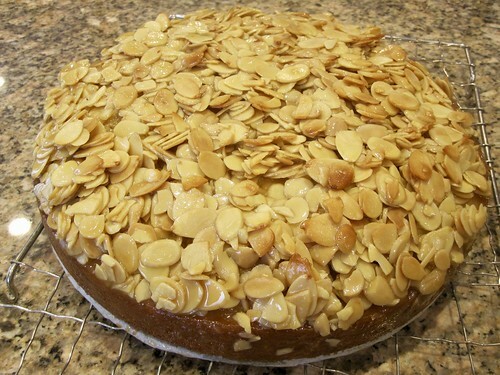 Put the almond-topped cake back in the oven and bake until the caramel between the almonds starts bubbling up thickly between the almonds, about 8 minutes. Remove from oven. After 5 minutes, run a knife around the outside of the cake to release it from the sides of the pan then let the cake cool completely before serving and slicing.